The Newcastle United Blog | » Portuguese Press Give Magpies No Chance – Good! Portuguese Press Give Magpies No Chance – Good! It seems like the local Portuguese press have already written off Newcastle having any chance tonight at the Estádio da Luz in Lisbon. So it looks like we already have the opposition exactly where we want them, and manager Alan Pardew is aware that if we start well tonight, then there could be concerns ripple through the Benfica side. “If we can shock them in that opening period, we might get something out of the game.” “We need to take some important lessons from Man City. For all the information we tried to put into the team, we got a negative reaction. All the stats point to a Benfica win tonight, but in football you never know, and with this Newcastle side, you just never know. We have to hope for the best – but at the very least we need to be competitive in Lisbon, which we weren’t on Saturday in Manchester. Next Post Who Wants Andy Carroll In The Summer For £17M? Hopefully we can put them on their back foot and surprise them, hopefully. …. They have runners all over the pitch and we must track them or we will have no chance. Still these games are the ones we all wanted …. Well – they’re probably right. We’ve got to be underdogs in Portugal. Maybe it’ll kick our lads up the backside and we’ll get a result. A score draw would do nicely. Benfica haven’t lost a game since October, it’s about time they did, and why not tonight. judging by pards comments, he is not very confident. if this -if that , maybe this ,maybe that -nothing positive at all in what he says.- i feel a disaster coming on, maybe worse than saturday. Our lineup has changed so much this year it must be hard for a team like Benfica to really know what to make of us. Cabs makes a huge difference as well as new recruits like Sissoko. If they just look at our domestic league position then they are underestimating us. I doubt they’re daft enough to be lulled into a complete sense of false security and throw on the B team against us but hopefully it might influence one or two small decisions in their setup. I’m just going to enjoy tonights game, win or lose. Hopefully we will attack to worry them too but if not i’ll just sit back and watch them play some nice stuff and watch our boys fight them off. I know I shouldn’t have let low fell get to me. But if I wasn’t a NUFC fan and my partner wishes I wasn’t!! why would I invest so much time in following them. His question was who I have ever liked as a NUFC manager and who had been more successful than Pardew. Well you can’t argue that KK and SBR were and played way better football and as I hate to point out Pardew hasn’t won any more than KK and SBR. Supporting NUFC and liking the manger aren’t mutually exclusive but not liking or rating pardew apparently makes me a mackem and a mouthpiece, It’s pathetic. I just want the best possible manager for my club. 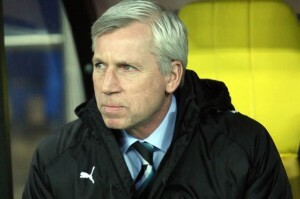 Hand on heart can anyone really say Pardew is that man. If Pardew can win a cup over a few games I’d be delirious sorry di- lirious. Last season we got 65 points. This season since the new boys game in for the villa away matchwe have won 4 and lost 4…50% points return. Over a season thats 57…so not hugely far from last year…still would have been enough for 6th last year. So i think our form since then, although defeats to wigan and swansea are annoying…..the general form has been decent. Just the performances haven’t been fluid…but then they weren’t last year apart from the off game when things seemed to really click. I hope benfica think they can turn us over, it will shock them. Even if we lose i think they will have to work extremely hard, they have some good players but in europe no games are easy…they struggled against celtic…narrow win and draw so not unstopable. When Mourinho won the CL with Inter he would regularly say to the players everyone has written you off, the press is against us, the refs are against us, the whole world thinks we’re going out type of rhetoric. It had a huge impact and made his players a very tight and highley motivated unit who felt like they were defying the odds and that helped produce the results which won them the competition. Depends what people count as success…trophy wise none of our managers are. But is getting us to challenge for the league and spend a couple years in champs league a success? its certainly more than pardew has brought so far. Style of play is something i like to see. I pay money I want to be entertained….yes a tense 1-0 is entertaining but not every game, it does become tedious after a while. Can accept it in a cup but in a league you want to see some free flowing stuff. I think you and catchy are as much a fan as any other here, you support the club. We all here are fans of newcastle for life….we only support pardew and players whilst they are with us (obviously some who do great things for us are supported where ever they go, but in general its just while they are here). Front three have speed, middle three can pass.. Not much width.. But could work?! Any thoughts on the line up? I just find Pardew’s mutterings very strange. At city I’ve never seen a team so beaten before they had even got on the pitch. An away goal is crucial tonight. I really can’t see us shutting them out in the games…i think they will get at least 1 in each leg. Hopefully we can shut them out but i wouldn’t bank on it. We need 1, if not more goals to bring back to the home leg. has there been anymore on the benitez rumours today? I appreciate that. You know where we’e coming from. but as you say it’s an entertainment as well as results business and if it’s same old, same old every time you get pretty fed up with it. Doesn’t mean you’re not a fan. Whats the story with Benitez? I always tried to defend catchy on here. I never agreed with him, i think he had some points but the action he would take was different from how i would approach it. But there was a love for the club which causes his dislike of pardew…it wasn’t a blind hatred…although it was stronger than I felt he deserved. Id love pardew to succeed, he needs help though. He has never played or coached in a technical team made of mainly overseas players as far as I am aware. How is he expected to know the best way to get them playing to their potential? I’m sure guardiola would struggle to get a team like stoke to play effective hoofball….he wouldn’t know all the little details you need to know to get it to be as effective as it can be. I have been saying for months pardew needs a cood coaching set up, not just local guys, to work with him and the team and introduce him to a more modern game, and let him see first hand how it can be effective at both attacking and defending. after a separate rumour linking us with torres, there is one saying ashley is looking into the opportunity of appointing benitez. somebody just mentioned last night a fairly credible source on twitter said he might be considered for our manager next season to replace pardew. Then I saw sky sports running a story about how he would consider another job in england when he leaves chelsea in the summer. made me think where would he go? chelsea again? no….man utd, liverpool, city, spurs? no….arsenal? no…doesn’t leave many clubs for him to consider. I’m not sure. I’ve never been a huge benitez fan, he seems to buy bad players if given time, although some gems too. I think if he was left to coach and manage the players we have and carr and co brought in the players for the positions benitez wanted then it could work. He gets a lot of stick, and hasn’t been great at inter or chelsea but he still has the chance of two trophies this year. He has been liverpool’s best manager in a long time, made big decisions (played gerrard out on the left, right or wrong not scared to do what he thinks is best for the team even with the biggest players….Ba getting a central role is opposite). He has won the league with valencia, runner up with liverpool and won 2 champs leagues plus reached a final. it would be a great starting point to get a technical coach in to assist pardew if his arrogance would allow it. Let’s be honest though if pardew was chocolate he would eat himself and he probably thinks no one can teach him anything. no idea on pardew…he has a lot of faith in his ability. Not sure if its to the extent he refuses outside help though, i can’t say i know either way. I think if he was told he had to have some coaches in to improve results/style then he has no choice…and if he didn’t use them properly he would be replaced. I think he would work with them in that situation as he won’t get a bigger job than us…we are about his max level i think….he wouldnt get a man utd, chelsea, city…not even spurs either. fulham is out biggest league game….its the weakest team we play at home…after sunderland but derbies can go either way so never as clear cut. As usual Pardew spends more time talking of how good the opposition are so he don’t look to bad after a loss.Lets just work on how good we can be and let them worry about us.Annoying all his tripe put the work in and let the football we play do the talking. It does get annoying but he will get asked questions about them. And if he says they aren’t good or we will beat them easy it can fire them up. I think he praises too much but i’d rather that than him insult them all and get them fired up. All he has to say is no comment about Benfica I just focus on working with my players.The guy just loves to hear himself talk.The crap he comes out with like the opponents won’t let us get quality crosses in is just a joke. a manager with more than one tactic. sounds good to me. sign him up!!! We should write a chapter of Pardewisms !! I don’t see why we should get a coach in to help Pardew do the job he should already know how to do. We owe him nothing so if he can’t do the job and get the team playing then we should get a manager who can. Pardew has had 2 1/2 years and there has been no footballing progress in terms of quality. Anybody who says there has is foolish. We haven’t played decent football since Glenn Roeder and haven’t played good football since Sir Bobby. We now have the quality that we’ve been crying out for. Technically amazing players. Look at Cabaye’s highlight reel from when he was playing more forward and look where Pardew plays him. We’ve seen Marveaux play excellently and yet can only get on the bench. Anyone who knows Dutch football will vouch for Anita and his ability yet he can’t get a game. Cisse is one of the deadliest predators in Europe, absolutely ruined this season by becoming a target man/right winger. It’s the fundamentally easy things Pardew is getting wrong and he is doing it to make his team sturdy and hard to beat. It doesn’t work with these technical European players. I’d rather Pardew play Simpson, Williamson, Perch and fecking Ameobi if we are going to play those tactics game in and game out. He is totally lost in his own mediocrity and hiring a new coach to help him is not the answer. A new manager who can do a better job without the help Pardew needs and would reject anyway is.